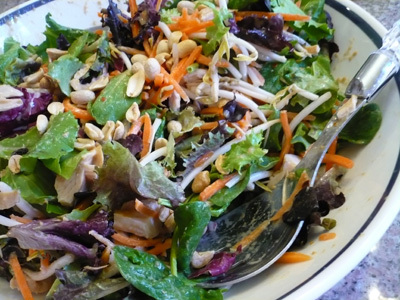 This salad is really tasty and so easy to make, especially if you use a rotisserie chicken. It’s a perfect summer dish. The original recipe called for warm dressing, but since I’m not a fan of wilted lettuce, I let the dressing cool after cooking before adding it to the salad. The dressing would also be really good over rice noodles too. Recipe adapted from the April 2011 issue of Cooking Light. Combine coconut milk and next 5 ingredients (through red pepper) in a small saucepan; bring to a boil. Reduce heat, and simmer for 5 minutes, and let cool. Pour cooled coconut milk mixture over lettuce mixture. Sprinkle with peanuts; serve with lime wedges.